Aurora Cannabis (TSX:ACB)(NYSE:ACB) announced today that they have made a bid for private BC organic cultivator Whistler Medical Marijuana. ACB values their all-stock offer at $175 million including escalators that Whistler can hit for certain performance milestones, yet to be disclosed. The deal is subject to shareholder approval from Whistler. A consumer imposed premium on organic products surely exists, and we’re still trying to get a bead on what that premium is in the cannabis space. Whistler is the only LP with organic marijuana presently being stocked in stores. Eighth-of-an-ounce portions of the three strains of flower that they sell in BC go for $62.99; the most expensive eighths in the country. Aurora’s most expensive flower offerings go for $46.10/eighth. The average shelf price of eighths in our latest sample of retail SKUs is $34.68. $63/eighth retail price comes out at $18/g gross cost to the consumer, which, considering it contains the retailer’s end, isn’t nearly the $17/g net that Willis projects Aurora will have to clear to get their money’s worth, but 2020 is a long way off. Surely, an outfit projecting as much square footage and capacity as Aurora is wants to use it for high-margin, premium bud to the extent that they’re able. And eighth of Whistler Medical Marijuana’s Chocalope strain fetches $62.99 at the BC Cannabis store. Click here to get a look at the terpene profile, but only if you’re 19 or older! Smith didn’t waste any time pivoting this story line to everyone’s favorite organic grower of the future, The Green Organic Dutchman (TSX:TGOD), which twitter quickly pointed out isn’t the same thing. 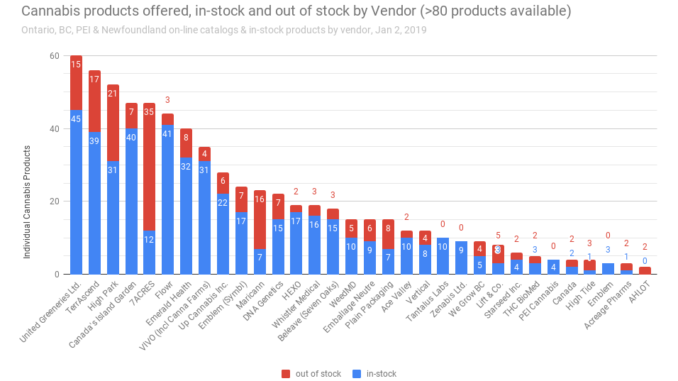 Who knows, but ACB seems to want to sell off a ton of TGOD..
Because Aurora had 145 available SKUs in the provincial retailers this month, Whistler Medical had 16, and TGOD had none. As Fundamental Hype is fond of pointing out to TGOD fanboy and current FH antagonist Chris Parry of Equity Guru: TGOD does not sell any weed. This market is developing without any of their products, because TGOD aren’t shipping anything to patients or to the rec market. Not with re-sold weed that they’ve acquired on the wholesale market or from their internal operations, which are very, very new. TGOD’s planned 150,000 square foot facility in Hamilton, ON has been limited by a resolution of city council to a maximum of 24,000 square feet. We have their current licensed square footage at the site down as 7,000 square feet. TGOD’s most recent financials (period ending September, 2018) listed the carrying value of their biological assets as $586,000. The period before that, it was $27,000. For comparison, Vivo Cannabis (TSX.V:VIVO)’s September financials carried $1.6 million in biological asset value, and $9.6 million in inventory value. 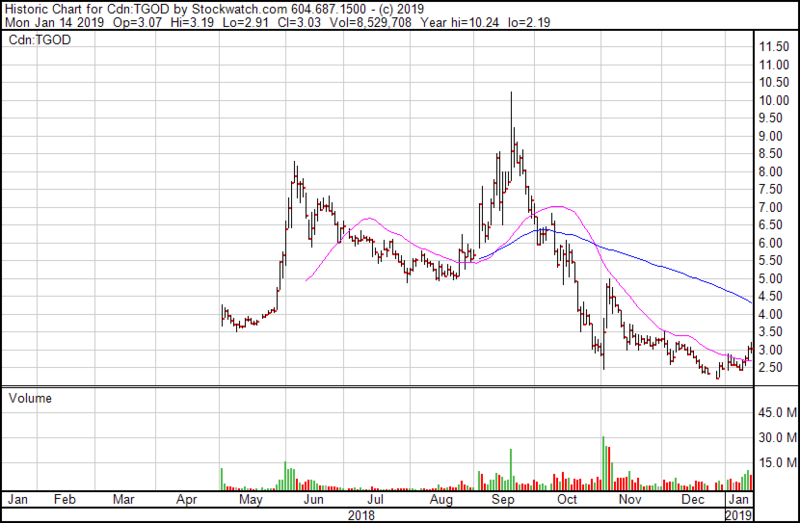 We picked Vivo because they have the next smallest licensed footprint on our comp sheet (though it has gone up since our last count following their acquisition of Canna Farms). Top-tier cultivators with larger operations carry considerably more bio asset value and inventory. TGOD values no inventory. 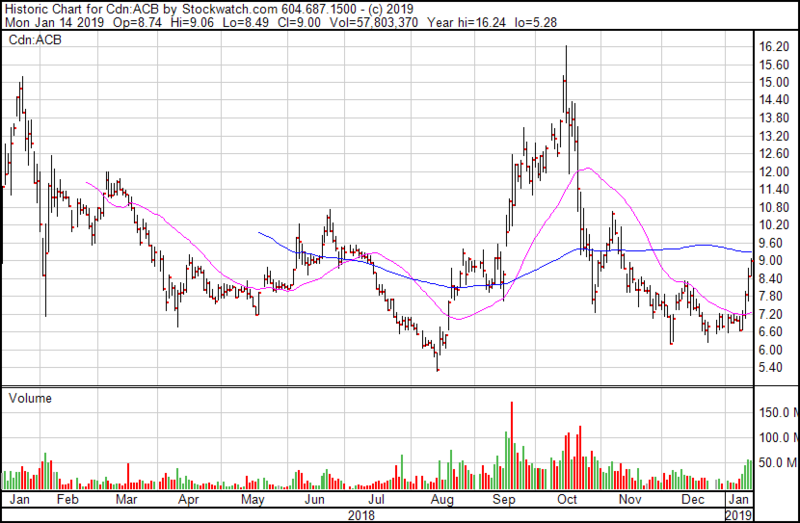 TGOD chart courtesy Stockwatch. TGOD lost more than $900 million in market cap this past October, as ACB peppered off 6 million shares. Aurora is as aware of this as we are, having peppered off 6 million shares of their TGOD stock in October at an average price of $5.66, grossing them $35.9 million. That sale reclassified their TGOD ownership from one of significant influence to one held for investment purposes, changing the accounting designation of what was a $133.2 million investment in an associate, carried at cost, to one that can be counted as $272 million worth of marketable securities, and the cash from the sale (though now it’s only $101 million in marketable securities. Aurora’s Sep quarter was the first in which it netted out in the black, thank’s in part to $87 million in unrealized gains on marketable securities). Should Aurora’s $175 million bid for Whistler Medical Marijuana go through, they’ll be adding the company producing the most valuable flower in the nation for less than 2% of Aurora’s existing market cap. Putting it that way makes us wonder if it’ll go quite that smoothly. 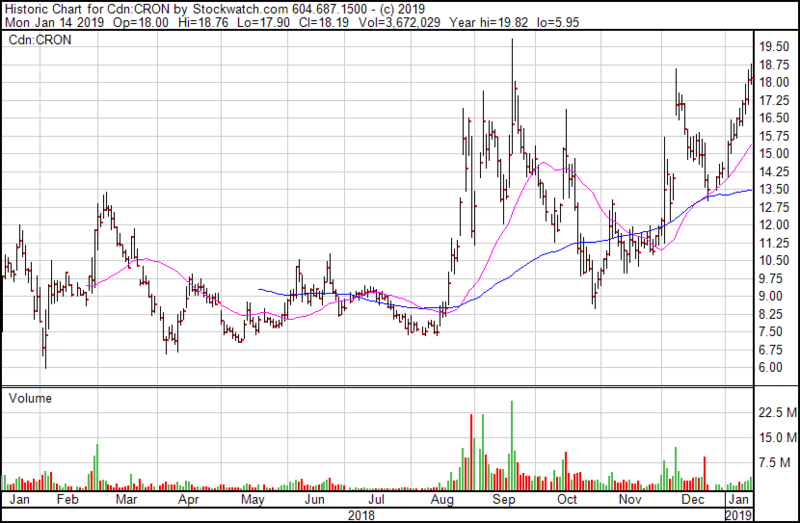 Cornos Group Inc. (TSX:CRON)(NASDAQ:CRON) owns a 19% stake in Whistler Medical, and may not want to give it up for $33.2 million worth of Aurora stock. 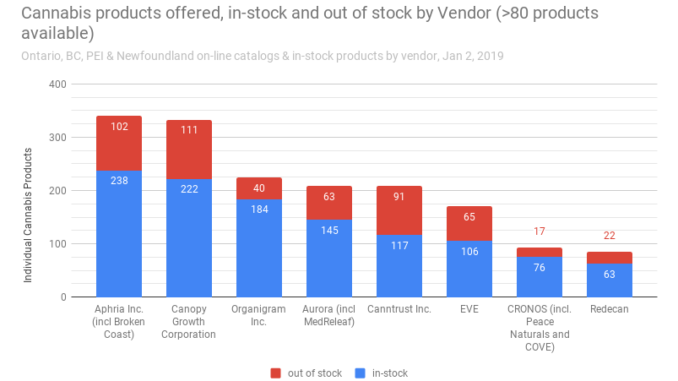 Assuming premium organic brands are as important to CRON’s growth strategy as they are to Aurora’s, Cronos may elect to come over the top to its fellow Whistler shareholders, making a pitch at a higher number or one that contains a cash component. 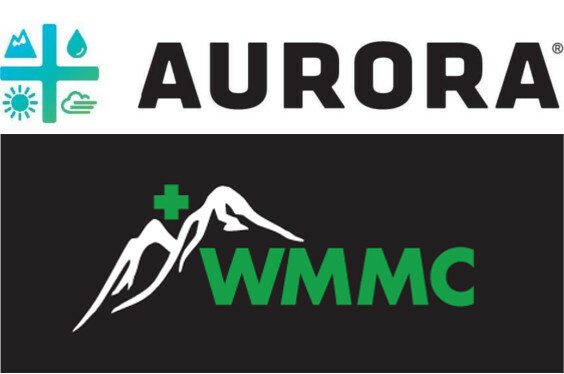 The knowledge that Aurora wants Whistler Medical is surely good news for CRON either way. Their preferred outcome would surely be for Aurora’s acquisition of WMMJ to have to include the rest of Cronos’ assets, and cost a lot more than $175 million. The market liked Aurora’s bid for WMMJ, sending ACB up $0.53 to $9.00 (+6.3%) on 57 million shares of volume. Whistler Medical shareholder Cronos Group and their $3.2B market cap may have something to say about this bid before the dust clears.